Mazda isn’t a manufacturer that goes overboard when it comes to trim levels, and it's perhaps the complete opposite of some European and US manufacturers who offer more trims and engines than sometimes appears necessary. It's perhaps not as straightforward with the 2017 Mazda3 as it is with the likes of the Mazda5 with its two trims and one engine though, but that's only because the Mazda3 is available in two body styles. So here are the 2017 Mazda3 trim levels explained. Although at first glance they look very similar, a move around to the rear of the two cars reveals they are actually two different body styles. Although they both have four doors, the Mazda3 is a regular sedan with a trunk, whereas the Mazda3 Sport is a hatchback. The hatchback therefore allows better access to the rear of the car and there's also a difference in the amount of available cargo space in the two versions. When it comes to trim levels though, the specifications are exactly the same. The GX is the entry level model in the Mazda3 lineup. It comes standard with the SKYACTIV-G 2.0-litre DOHC 16-valve four-cylinder engine, which produces 155 horsepower and 150 lb.-ft. of torque and is mated to a standard six-speed manual or the optional six-speed automatic transmission. Most essentials are covered such as standard power features, but there are also some pretty upscale things standard, including push-button start, remote keyless entry, and some advanced safety features. The GS is the middle of the three trim levels, and it adds quite a lot to the standard features and equipment of the GX model. The GS gets 16-inch alloys wheels instead of steel wheels, air conditioning with manual climate control, steering-wheel mounted controls, a rearview camera, Bluetooth infotainment with a 7-inch colour touchscreen, auto on/off headlights and more. However, the Mazda3 GS has the same engine and transmission options as the entry level GX. 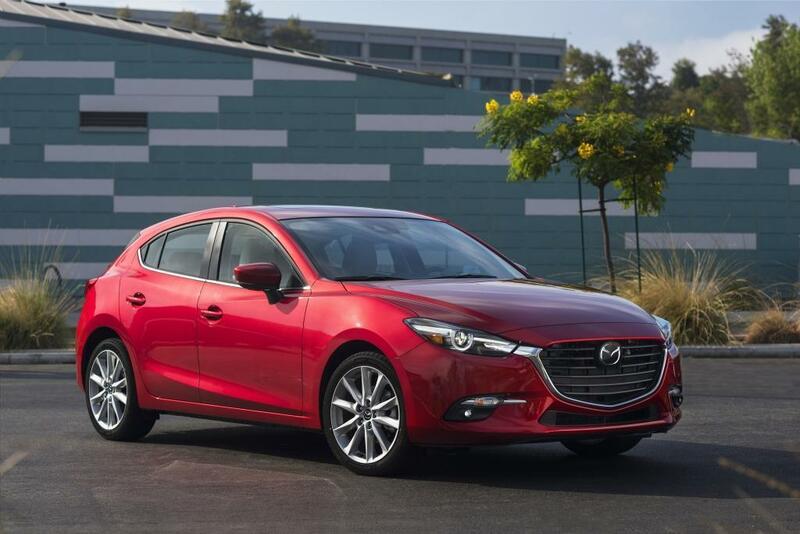 GT is the highest trim in the Mazda3 and Mazda3 Sport lineups, and combined with the stunning styling of the car, it infringes on luxury levels of features and equipment. Unlike the GX and GS models, the GT gets a more powerful 2.5-liter four-cylinder engine that develops 184 horsepower and 185 lb.-ft. of torque. A six-speed manual transmission is standard, but a more advanced six-speed automatic with paddle-shift activation is offered as an alternative. The wheels are one of the most obvious upgrades over the other models as they're 18-inch alloys this time, while headlights, tail lights and fog lights are all LED with this top trim GT model. There's an almost full complement of infotainment in the GT, although to get the voice-activated navigation does mean upgrading to the Premium Package. There are a number of features available for the GT that are not available elsewhere in the range, although it does mean paying for upgrade packages to the standard GT specification. The available packages are the Premium Package and the Technology Package. The Premium Package gets you the likes of leather upholstery and a Bose nine-speaker sound system, and advanced safety kit such as Lane-Keeping Assist and Lane Departure Warning. The Technology Package includes: i-ELOOP regenerative braking system, active air shutters, Adaptive Front lighting, SiriusXMTM Satellite Radio, the HomeLink wireless control system and Traffic Sign Recognition system. For more information on the standard and available features and equipment and to arrange a test drive in the 2017 Mazda3 or Mazda3 Sport, don’t hesitate to get in touch with us here at Yarmouth Mazda.